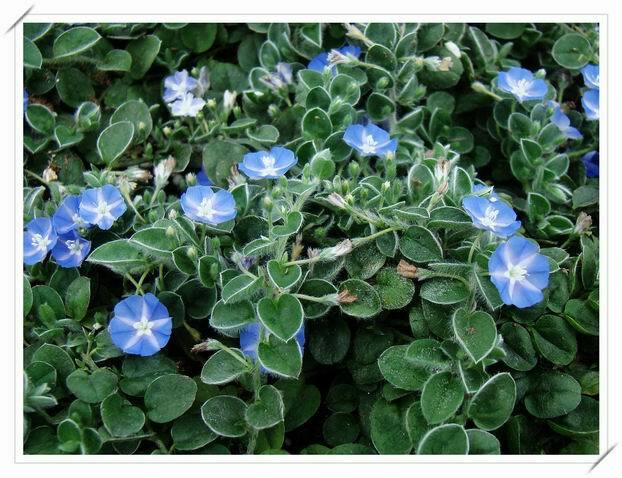 The drug is the dried or fresh whole herb of Evolvulus alsinoides L. (Family Convolvulaceae), growing on grass slopes, in scrubs or along roadsides, and distributed in Southern China. Pungent, bitter, cool; liver, spleen and kidney meridians entered. Whole contains flavonoid glycosides, phenols, amino acids, saccharides, sitosterol, betaine, etc. Whole herb is used as antiasthma, antipyretic, diuretic, antioncotic and analgesic, for the treatment of jaundice, dysentery, stranguria with turbid urine, leukorrhea, indigestion, urinic system infection, hematuria, asthma, cough, externally for scabies and traumatic injury. Decoct 3~10 g, or 30~60 g of the fresh, or pounded into juice for drinking. Proper dosage is for external application, pounded for applying or decocted for washing.